Alhamdulillah, praise is all due to Allah. Nothing is more important in teaching than placing “intention” as the point to begin, which is aligned with the tradition of our scholars who many of them began their books with the hadith (إنّما الأعمال بالنيات). 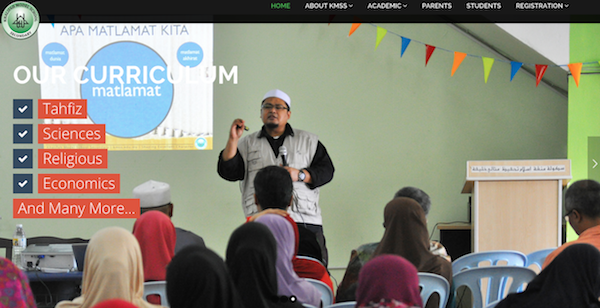 Our school’s name is Khalifah Model School (kmss.edu.my) and the niche of our school is the Khalifah Method. It is all about being Khalifah, shaping our students to embrace the idea of being Khalifah and having the quality of Khalifah. Khalifah is placed at the world view level which produces approaches, policies and curriculum. Being Khalifah: The Angels’ point of view, it requires the quality of obedience manifested in the characteristics of them (we praise and sanctify You while Adam is potentially causing corruptions and shedding blood – Q2:30). But Allah chose Adam for a very important characteristic He embedded in Adam and the offsprings and that is Adam is a learner, a rational being, who can learn and explore by his choice which is more superior to his potential of causing corruptions and shedding blood. Allah knows and the angels do not know. The main character of a khalifah is he or she has the capability to learn and understand, which makes teaching and helping the learners understand is the most divine responsibility and role to play. It begins with Allah teaches Adam, and Adam’s offsprings teach each other to continue to similar divine process. Possessing knowledge, wisdom and the legacy of Prophethood led the transgressing people to direct the learners to themselves instead of God. This caused destruction to the previous nations and a bold reminder to us. ِAvoid the mistake committed by the people of the book as Allah describes in surah al-Tawbah 9:31. Therefore, the teacher, the learner and the knowledge must all be characterized with the quality of Rabbānī and that is to base everything on Rabb (Allah). The knowledge must lead to Allah, be it the revealed or the scientific knowledge, the students must seek knowledge with the Rabbānī motive (I go to school and learn, not only to pass exam and have a good career and life, but to fulfill my purpose of life, know my Creator and submitting myself to my Him), and most importantly, the teachers teach with a strong faith that teaching is a TRUST. Question: What do you currently do in your classroom teaching to embody (yourself) and reinforce (to your students) that teaching and learning is a trust and that we, as human beings, are God’s vicegerents (khalifa) on earth? Our goal in Khalifah Model School is very clear at the conceptual and practical level and that is “SHAPING EXCELLENT CHARACTER”. In terms of academic, we strongly believe that academic excellency is byproduct when the students possess the excellent character. Keep the physical world clean and beautiful, pleasing to Allah. This is also the school oath which the students repeatedly recite during our Friday morning assembly. As for the academic level, for example, when students sit for their Mathematics’ paper, students are given the option to choose which paper they want to answer: the basic, the intermediate or the advance paper. The advance paper allows students to use calculator and refer to text books. The intermediate paper allows students to refer to text book with no calculator. The basic paper does not allow students to refer to text books or use the calculator. This is to teach them to exercise their free will and taking the responsibility at the highest level. If the result is very poor, students are allowed to resit the subject with different mode of paper. Students with good result can help their peers with difficulties and if they manage to help their friends, they can claim small extra marks for the paper as a reward for “help others to become good”. How by learning this subject, you can make yourself good? How by learning this subject, you can help others to become good? How by learning this subject, you can keep the physical world clean and beautiful, pleasing to Allah. This is at the classroom level. ‘FarmVille’ : Students are sent to appointed farm and learn from a retired professor in agricultural biotechnology vaccines about ecosystem, learn how to rear chicken etc. ‘Marine Adventure’: Students learn scuba diving and obtain license with the idea of “having the license to serve others”, learn about marine life, turtle management, crisis in pollutions etc. ‘Arabia de Sumatra’: An Arabic intensive course in a form of a student exchange program: Students are sent to our sister school in Indonesia for one month to learn Arabic in a non Arabic surrounding which the sister school has the best Arabic program in Indonesia. ‘Malaysiana Jones’: based on the adventure of the ‘Indiana Jones’. Students participate in history and archaeology activities involving excavating archaeological sites, visiting museums and libraries, archive study, to promote historical thinking consciousness. ‘Avengers’: A philanthropy program teaching students how to make proposal for fundraising and organising volunteerism involving visiting hospitals, cleaning mosque and beach, feeding the needy, distributing iftar kits for people leaving office etc. Master Chefs: a culinary course where students learn about safety in kitchen and catering unit, knowing all the tools in kitchen and learn to cook, bake, and many other culinary skills. All these activities are connected each other with the idea of being Khalifah. In summary, being Khalifah to us means: exploring your uniqueness, strength and talent given by Allah, nurture and expand them, and use them to serve mankind, to please Allah. As for teachers, we are consistently reminding each other and I share ITEP videos with our teachers and discuss them on weekly basis.